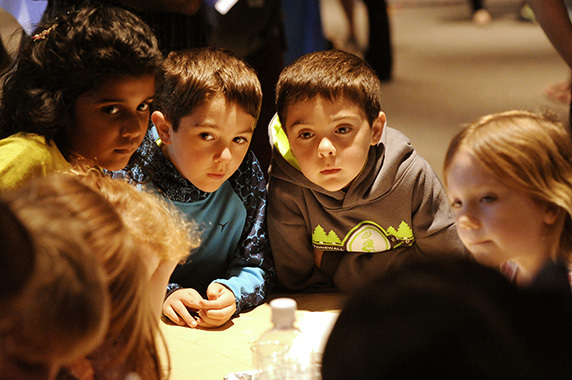 About 200 kids and parents attended the first-ever Science in the Cinema event, hosted April 24 by NIEHS at the Marbles IMAX Theatre in downtown Raleigh, North Carolina. 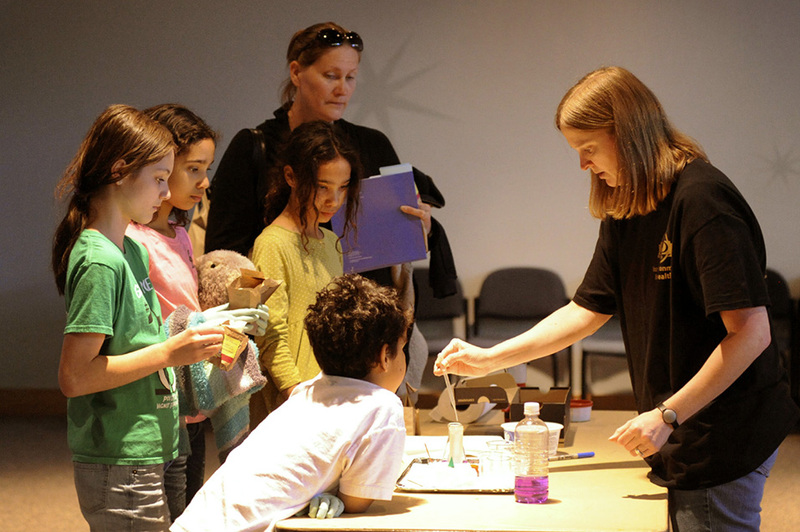 A free screening of the movie “WALL-E” was followed by hands-on activities, led by NIEHS scientists and staff, highlighting some of the environmental and health topics raised in the film. “What struck me most was the energy and enthusiasm in the room,” said event emcee Nigel Walker, Ph.D., one of the scientists from the National Toxicology Program (NTP) who helped bring the program to fruition. “Seeing kids have that lightbulb moment, when they really got the concept we were trying to teach them, was priceless,” he added. 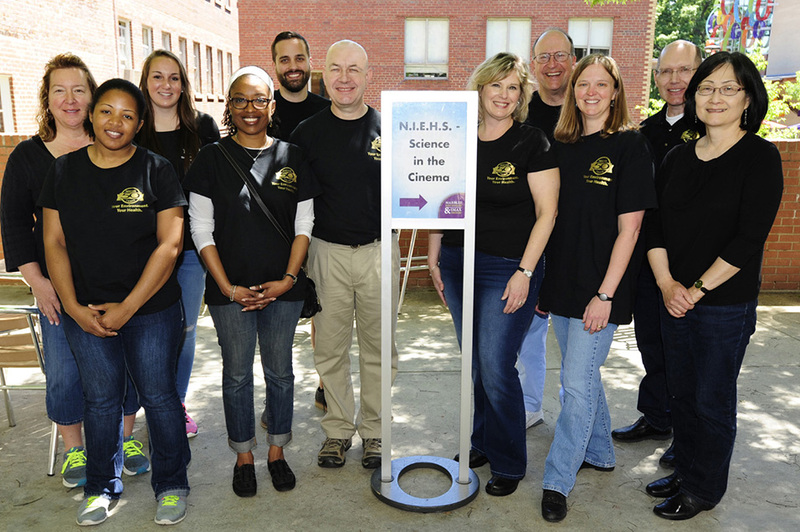 The event was part of NIEHS outreach to bring visibility to the institute and its 50-year history in Research Triangle Park. 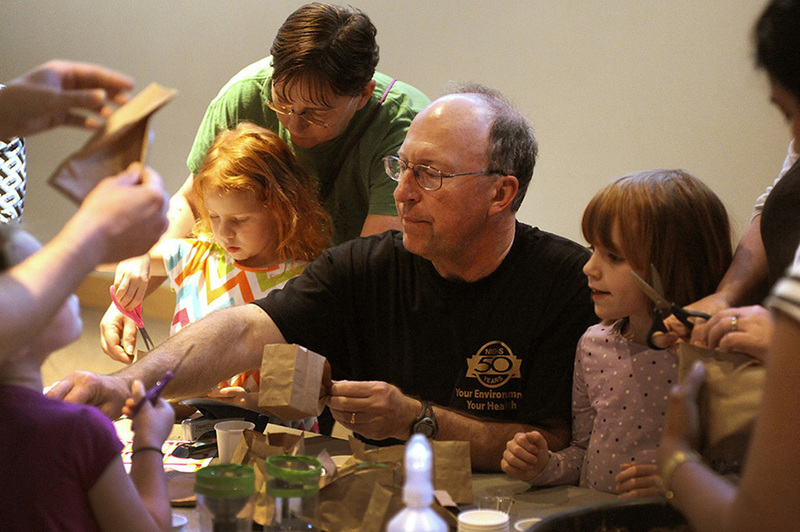 Located in the nearby state capital, Marbles Kids Museum, known for its family-focused, play-based learning activities, was a natural venue for the community program. Eight scientists from across the institute worked for several months with the Office of Communications and Public Liaison (OCPL) and the Office of Science Education and Diversity (OSED) to develop an educational program that would connect with the movie. Four themes emerged. Toxicology and how we study chemicals. Combating obesity with the built environment, healthy eating, and physical activity. Protecting the planet and our health. Appreciating the value of recycling and reusing materials. 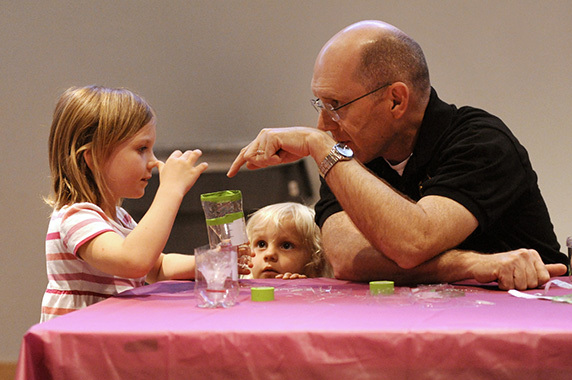 From these themes, the team developed kid-friendly activities to offer after the movie showing. Children and adults alike engaged in planting sunflower seeds, finding new uses for plastic bottles, hula-hoop play, learning to make healthy food choices, using worms to discover how animals and people respond to their environment, and donning lab coats, goggles, and gloves. Huei-Chen Lao, also of OSED, worked with Reid and Mike Humble, Ph.D., from the NIEHS Division of Extramural Research and Training, to lead a reuse activity — making plant holders from empty soda bottles. Humble said he enjoyed working with people from across the institute to make the event happen. 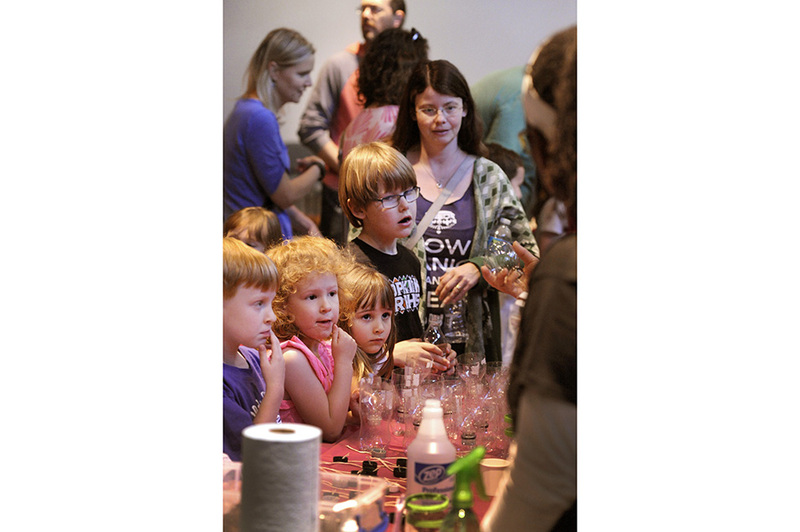 Abee Boyles, Ph.D., of NTP, joined Walker to offer two toxicology experiments that were big hits among the kids and parents. 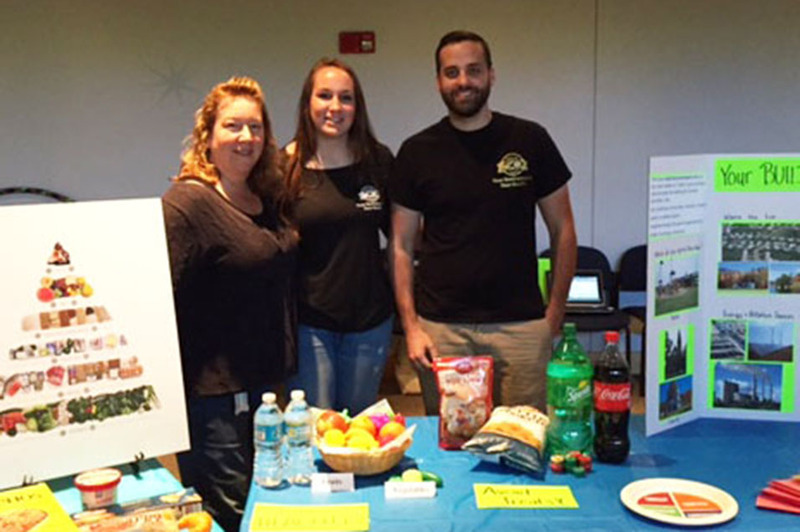 Sue Fenton, Ph.D., head of the NTP Reproductive Endocrinology Group, worked with trainees Deirdre Tucker and Adam Filgo, Ph.D., of her lab, as well as her 16-year-old daughter, to offer activities related to reducing obesity. They provided food for kids to put on plates in a lesson about portion sizes, emphasizing larger portions of fruit and vegetables. Jump ropes and hula hoops were on hand to highlight the value of regular exercise. 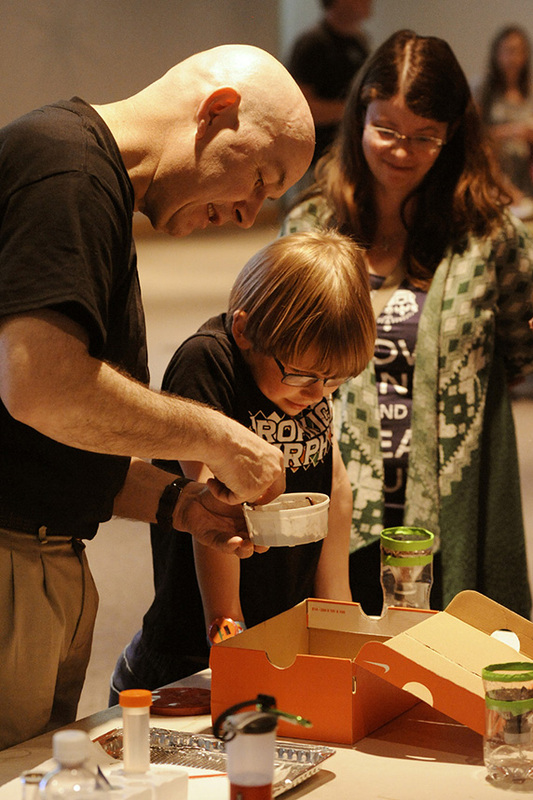 John Roberts, Ph.D., from the Division of Intramural Research, had buckets of dirt, water spritzers, and packets of sunflower seeds, making him very popular at the event. Participants enjoyed making paper-bag holders for their plantings, and were hopeful that in a few weeks, a healthy sunflower would emerge. 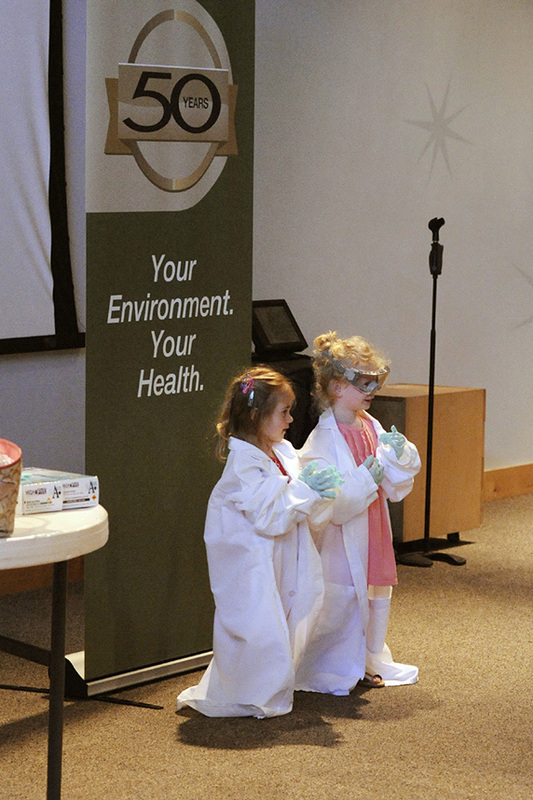 “We saw this event as a unique opportunity to engage our local community and raise awareness of environmental health in a way that people of all ages could connect with,” said Christine Bruske Flowers, NIEHS Director of Communications and head of the 50th Anniversary Committee. 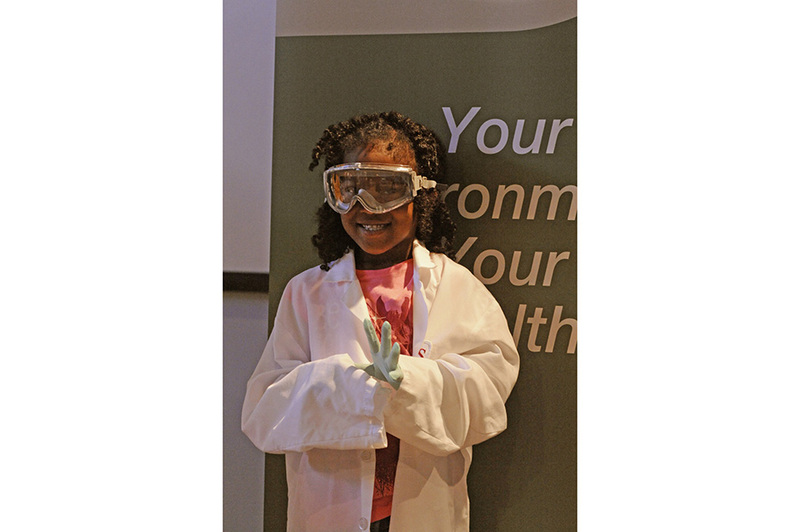 NIEHS offers a variety of materials and programs to spark kids’ interest in science and environmental health, including a new, mobile-friendly website (see text box). The NIEHS Office of Communications and Public Liaison has launched an eye-popping new look for the ever-popular Kids Environment Kids Health, a resource for kids, parents, and teachers, offering fun and educational materials related to health, science, and the environment. To better reach this generation of young learners, the site is now mobile ready, designed to fit the small screens of phones and tablets, and without the need for tedious scrolling. With most of the U.S. population using mobile devices, more parents and children than ever can take advantage of the wealth of environmental health information, games, activities, and lessons available from NIEHS from wherever they are. The new design is easier to read and navigate, and each page has a kid-friendly icon for easy access to coloring activities, songs, and other fun things for younger children. next article - "Geneticists highlight communication, outreach, ..."